What is a True Multi-Cloud? The ability to work Seamlessly With Multiple Cloud Vendors. Eliminate vendor lock-in, allowing your application software stack to be independent of the underlying infrastructure. This independence also creates the interoperability required for fast migration or expansion of workloads. It allows you to run a specific workload on a specific platform, without worrying about the storage. NooBaa provides an AWS S3-compatible API, the de facto standard, independent of any specific vendor or location. 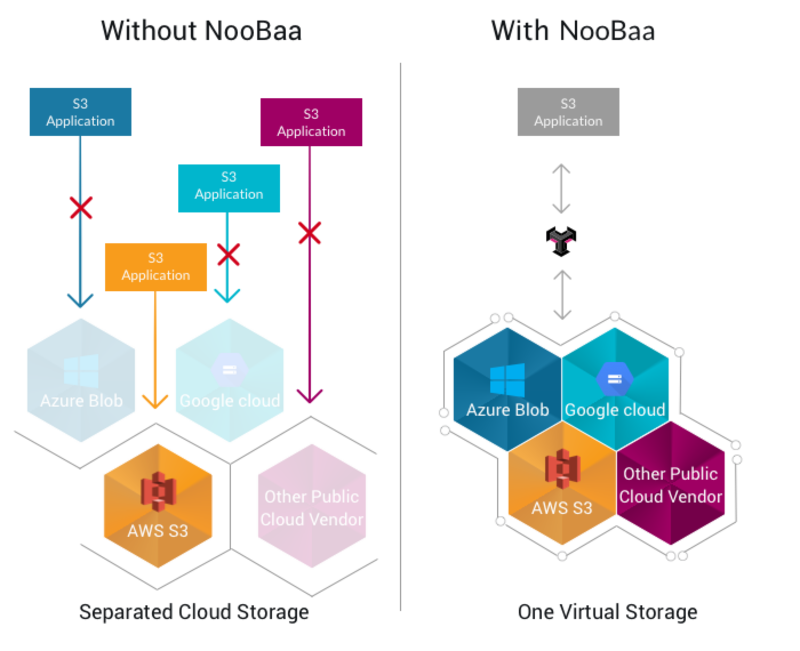 NooBaa’s multi-cloud approach also increases availability by allowing you to keep your data in multiple locations while using a single access endpoint. It is also extremely efficient in term of storage size due to advanced deduplication and compression algorithms and provides high levels of security by encrypting all data and creating an additional secure layer on top of any existing storage. How Does NooBaa’s Multi-Cloud Works? NooBaa allows applications to write data regardless of the physical data repositories. The core machine is the data controller and an endpoint. NooBaa endpoints can scale out and placed anywhere and applications connect to these endpoints and gain access to data repositories. Every NooBaa bucket has its own data placement policy, which determines where the data will be physically placed. Data placement policies are flexible and can be modified along the time. How is NooBaa different from other multi-cloud solutions?